Team of sewerage workers took three weeks to clear bus-sized toxic ball of fat that threatened to flood streets with sewage. A sewage worker has become an unlikely hero after taking three weeks to defeat a toxic 15-tonne ball of congealed fat the size of a bus that came close to turning parts of the London borough of Kingston upon Thames into a cesspit. The first sign of trouble came when residents in a block of flats near the royal borough’s main sewer reported difficulty flushing their toilets. Gordon Hailwood and his team found a “fatberg” of solidified grease and oil blocking 95% of the 2.4 metre diameter brick sewer pipe. It took three weeks working in foul conditions to clear with high powered water jets. “Kingston came very close to being flooded with sewage. We have recorded greater volumes of fat in the past but we don’t believe there’s ever been a single congealed lump of lard matching this one”, said Simon Evans, a Thames Water spokesman. Not a good likeness. 15 ton blobs of grease are not photogenic. 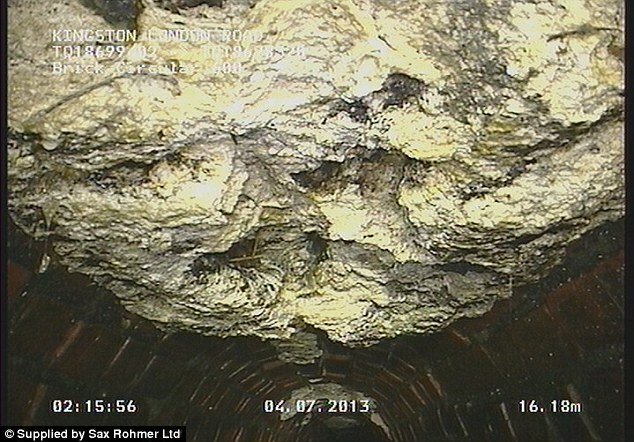 Fatbergs build up on sewer roofs like mushy stalactites. “I have witnessed one. It’s a heaving, sick-smelling, rotting mass of filth and faeces. It hits the back of your throat, it’s gross,” said Evans. Water and sewage companies say fatbergs are becoming more common. London, with the highest concentration of food businesses in the country, produces an estimated 32m-44m litres of used cooking oil every year, much of which is poured down drains. Also, the use of wet wipes as toilet paper is increasing, with potentially disastrous results below ground. Thames Water says it has to clear nearly 40,000 blockages a year caused by fat and sanitary wipes being wrongly put down drains by restaurants and households. “We have 59,000 miles of sewer and fat and wet wipes are the main partners in ‘sewer abuse’ crime,” said Evans. “The wipes break down and collect on joints and then the fat congeals. Then more fat builds up. It’s getting worse. More wet wipes are being used and flushed. It took Hailwood and the guys three weeks to flush this one out with high-powered water jets. “Given we’ve got the biggest sewers and this is the biggest fatberg we’ve encountered, we reckon it has to be the biggest such berg in British history,” said Hailwood. However – in what environmental groups call a “win-win” development – waste fat is now being used to generate renewable energy. McDonald’s collects more than 600,000 litres of used cooking oil from its London restaurants each year, converting it to biodiesel to run half its fleet of lorries. London mayor Boris Johnson is pressing for waste fat to be used to run London’s buses. “By capturing it right here in London and turning it into biodiesel we could provide 20% of the fuel needed to power London’s entire bus fleet while saving thousands of tonnes of CO2 and creating hundreds of new jobs. There is huge potential to unlock the value in used cooking oil and turn it to our economic advantage,” Johnson said last week. One consortium plans to generate 130 gigawatt hours (GWh) of renewable electricity each year – enough to run 39,000 average homes – by burning 30 tonnes a day of fat, oil and grease. The oils will be collected from food outlets and manufacturers, and solidified grease will be harvested from “fat traps” installed in restaurant, hospital, stadium and factory kitchens. Thames Water has agreed to buy half the electricity to run London’s largest sewerage works at Beckton. • Animal fats and vegetable oil, lard, grease, butter and margarine, food scraps and dairy products all contribute to blocked drains, “fatbergs” and sewer blockages. Waste disposal units do not remove fats. • Wipes, nappies, sanitary towels, rags and condoms do not break down easily and can snag on pipes, drains and the walls of sewers, leading to blockages. • Pesticides, battery acids, nail polish, motor oil, chlorine-based and other cleaning products, paints and photographic chemicals are all toxic waste and should be disposed of carefully because they do not break down in sewage systems and can pollute rivers and sea water. • If you have a septic tank, then be extra careful. Don’t flush medicines, coffee grounds, paper towels or egg shells, or anything that breaks down slowly, down the toilet or sink.